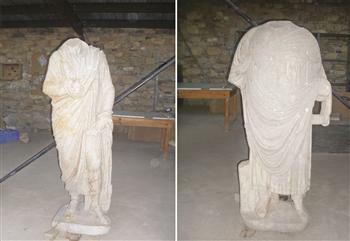 TURQUIE – Aphrodisias - The ongoing excavation works at one of Turkey’s most important archaeological sites, the Karacasu Aphrodisias Ancient City, have revealed two headless statues. According to information provided by the Culture and Tourism Ministry, one of the statues is in 1.76 meters in height and the other is 1.68 meters. One of the statues holds a roll in its left hand and its right hand is on its chest. There is a pack of documents behind its left foot, but the fingers and head are broken. The second statue is also headless. Its right hand is broken from the humerus down, and the left hand is broken from the elbow. There is also a pack of documents next to its right hand. INDE - Jaint Garh - A rare ancient Tampra- Patra belonging to 10th century A.D was discovered by archaeologist Harendra Sinha three days back at Jaint Garh, a small village near Chaibasa. Tamra-shasan or tamra-patra is a copper-plate grant representing engraved royal records of grants. Thus, these copper plates are being considered as a rare archaeological find. The copper plates were usually issued by the rulers or Zamindars of a particular area to an individual as a land grant. The tamra-patra includes the details of the land to be gifted, date of its issue, details of the ruler and his family, purpose of the grant along with the details of the beneficiary. The copper plate found weighs 1kilogram and 300 grams and measures 31X20 cm. On obverse it has a crescent at the top and a bull, looking left, below it which indicates the fact that that the issuer of the land grants was a Shaivite and a ruler of Chandravashi clan. Further below, the plate has a symbol inscribed which is embossed within a rectangle, revealing the clan of the issuer. Fascinatingly, the plate contains a 19 line inscription in proto Bengali script of 10th century on facade and a 10 line inscription on the reverse side. The copper plate being studied by Sinha at present and has been dated tentatively to 10th century, paleographically. “We would very soon decipher the copper plate which would am sure give a lot of new information about the history of Jharkhand, bringing new facets of the culture to light,” asserted Sinha. Coincidently, a lot of brick structures and old mounds related to king myths have been found in the area nearby the same village in excavations conducted by Archaeological Survey of India. 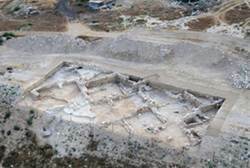 ISRAEL – Be’er Sheva - Archaeologists have discovered remains of a large 1,500-year-old Jewish town near Be’er Sheva, including two public ritual pools, or mikvehs, a synagogue or Torah study center. Mikvehs are used in Judaism for ritual purification purposes. Israel Antiquities Authority officials said the remains were found during excavation work in extending the southern leg of Israel's north-south super highway, Kvish 6, (Highway 6) to the Lehavim junction, located five miles north of the “capital of the Negev.” The remains also included two large public buildings, and the synagogue or Torah center was built facing Jerusalem, as is the custom in the entire Jewish world. Archaeologists said that the Jewish town was very large, located approximately 8 kilometers (3 miles) from another Byzantine-era synagogue, at Hurvat Rimon, and that it apparently was abandoned at the same time of the Islamic conquest at the end of the sixth or beginning of the seventh century. Yet another synagogue from the same era is located several miles east at Susiya, whose ancient community also was inexplicably abandoned. The discovery along the route of Kvish 6 follows several other finds since construction started on the highway several years ago. “They seem to be public buildings, judging by the location and character,” said archaeological dig director Nir Shimshon-Faran. He said that a new community was built over the remains, without any consideration of preserving them, and one of the ritual pools was covered by a new building. AUSTRALIE – Sydney - An archaeological dig at historic Barangaroo, now Sydney’s biggest building site, has yielded 102 boxes of artefacts that tell unique stories of the city’s industrial past. The finds, viewed by The Sun-Herald, provide an evocative picture of a male-dominated industrial society on the former 19th-century wharf with drinking and pipe-smoking rife on a foreshore pungent with raw sewage and busy with rats. Evidence of domestic occupation of the area were also uncovered, according to Ms Cryerhall. A building identified as a store was home to domestic items relating to women and children, pointing to its use at one time as a cottage. ‘‘It is interesting to see that this was an industrial site with a nice view of the sewage-filled harbour and Australia’s first gasworks and there’s a family living right beside it on the shore,’’ Ms Cryerhall said. ‘‘It was a bit of a surprise to get the women’s buttons and bobbins and some children’s artefacts.’’ Industries around Barangaroo would have included gasworks in the northern area from the 1840s, she said, which would have been quite noxious. USA – Alexandria - Fort Ward was built by the Union Army to protect Washington, D.C., during the Civil War. Now it's a historic site. 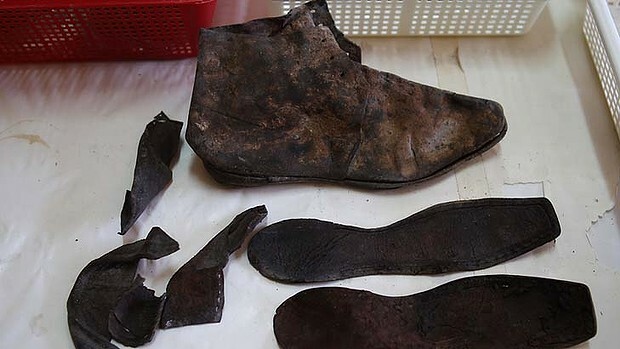 But an archaeological dig at the park identified the location of 43 graves, confirming that a portion of the grounds was once used as a cemetery. The dig also found the site of what was once the "Fort Community," a post-Civil War, African-American community that was occupied until the 1960s. About 1,300 small holes were dug. They were each about two to four feet in diameter and up to four feet deep and they were dug every 30 feet, says Mallemo. The small holes acted like windows into the past. 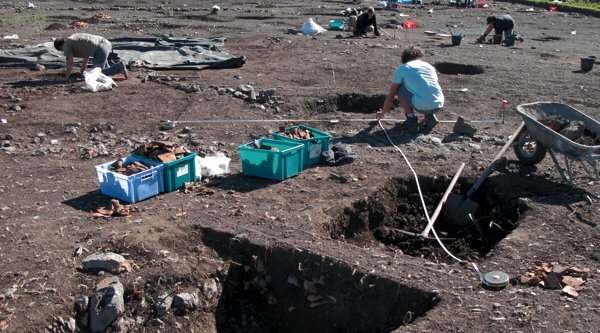 He says the holes gave archaeologists an idea if they could identify an area of significance. He says the 43 graves that were found in the park will be fenced off and all the graves, for now, will have blank markers. He says when, and if, the remains are identified, the person's name will be added along with any other information that is discovered. Three of the graves did have headstones.